Having Paws As Loving Support (PALS) facility dogs as part of our therapy program helps children and adults feel more comfortable and reduces anxiety associated with speaking, which can be a difficult task. Our goal is to improve a patient’s social, emotional, or cognitive functioning. 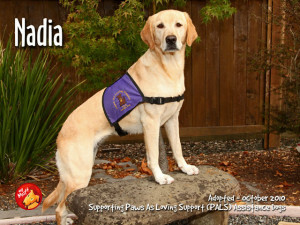 Facility dogs are useful for educational and motivational effectiveness for clients. They are also tools for therapy because they can make people feel safe and loved when they have been deprived of social interaction or hurt by other people. They do not communicate with words, and so patients afraid of approaching people can comfortably approach an animal. Additionally, a therapist who brings along a pet is viewed as being less dangerous by the patient, thus the previously uncommunicative patient is willing to share more with the professional. Having a facility dog here at The Swain Center is the number one motivator to get a lot of the younger children excited about coming to speech therapy. Several children with Autism have had huge meltdowns and have not been able to continue therapy on days when there was not a PALS puppy at work. However, on the days when there is a PALS puppy, it is amazing to see the significant changes in a child on the autism spectrum. With a dog present during a therapy session, these children show consistent and significant improvements in their abilities to focus, attend to and follow directions, interact socially with the therapist and other peers and effectively use their speech-language skills to communicate. 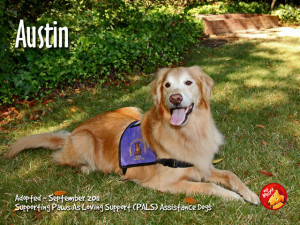 Austin’s best friend and owner is Michelle Chastain a Speech Language Pathologist here at The Swain Center. His favorite toy is his stuffed pink piggy. Austin wishes it was blue, but knows it is his mom’s favorite color. He enjoys snuggling and visiting with clients that come in for therapy here at the Swain Center. Austin also likes sleeping and looking out his office window. He enjoys long walks in Armstrong Woods and playing in the surf at Doran Beach. 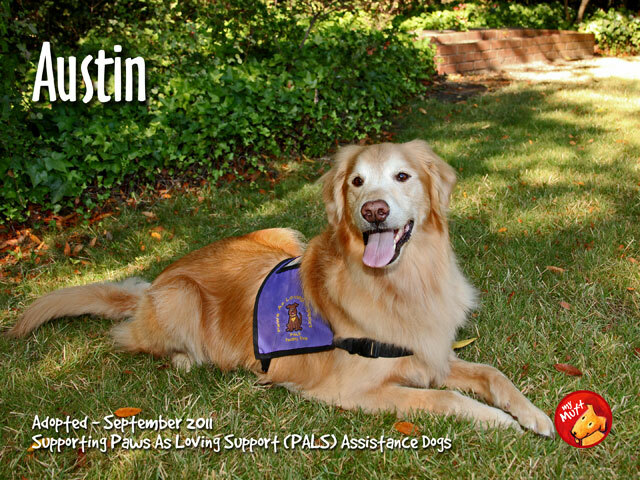 Austin is doing well in his intermediate agility and scent work classes. His birthday is November 12, 2009. PALS Comfort Team -Graduation June 21, 2014 (Paws As Loving Support) -PALS Comfort Teams help by providing much needed emotional support during or immediately after a crisis or traumatic time. Nadia’s best friend and owner is Michelle Chastain a Speech Language Pathologist here at The Swain Center. Her favorite toy is her glow in the dark ball. Nadia likes to pounce on her ball. Her favorite color is pink just like her mom’s. She loves to play in water. Nadia just wishes her blue kiddie pool was a bit bigger. She thinks tennis balls are fun to catch and destroy. However, her mom doesn’t let her have any stuffed animals because she eats them. Nadia enjoys scent work classes and foundation agility. She would love to join a dock diving team . Nadia’s birthday is September 1, 2010.